You surely have some leftovers from your Turkey Day feast. Would you like some new ideas on creative ways to use them? Let’s see what you have to work with. Do you have leftovers of any of these classics? Relish tray: celery sticks, carrot sticks, olives, green onions, radishes, sweet pepper strips, etc. You know that I’m all about soup. And there’s nothing wrong (and a lot right) with the traditional turkey-noodle soup you may be envisioning. But let’s look a little broader, shall we? POTATO SOUP. 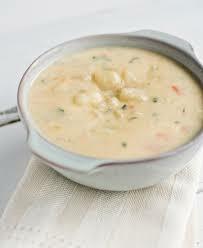 Most recipes for potato soup (and there are scads) tell you to start by cooking potatoes till very tender, then pureeing or mashing them, along with broth or milk, into smooth or chunky form. But if you start with leftover mashed potatoes, you’re already halfway home. Maybe more. Basic procedure: thin the potatoes with your choice of liquid: stock, milk, buttermilk, even water. This is easier with a blender or food processor. Taste as you go, add salt and pepper. Garnish with chopped parsley or scallions. Variations. To this basic potato soup, add these other leftovers and/or embellishments. Dip. Especially if its base is sour cream or cream cheese, a big scoop of leftover dip is an easy way to punch up the flavor. Broccoli (or cauliflower) casserole. Blend into the soup. If the vegetable pieces are too large to fit comfortably onto a soup spoon, use your blender to chop them first. Broccoli and potato is a classic combination for a reason, and cauliflower is just as good. Stuffing. Especially if yours contains sausage and pungent spices, a nice mound of stuffing adds body and depth to the soup. Whisk into the basic soup, or use a blender or food processor. This will make the soup thicker, so you may want to add extra liquid. On the other hand, if you used packaged bread cubes as a base for your stuffing and didn’t use the whole package, toast the leftovers in the oven and serve them with the soup as croutons. Did you have a cheese tray, and are there bits of different types left over? They would be perfect in potato soup. Radishes. Maybe you have just a few left from the relish tray. Slice one or two as thin as you possibly can, and float several slices on top of each serving. Similarly, diced green onions make a lovely garnish. Other possibles: These don’t actually qualify as leftovers, but you can embellish the basic flavor of this soup with curry powder, a bit of horseradish, chopped green chilies, or bacon. Of course, no one ever has leftover bacon; you’d have to cook it up specially for this purpose.